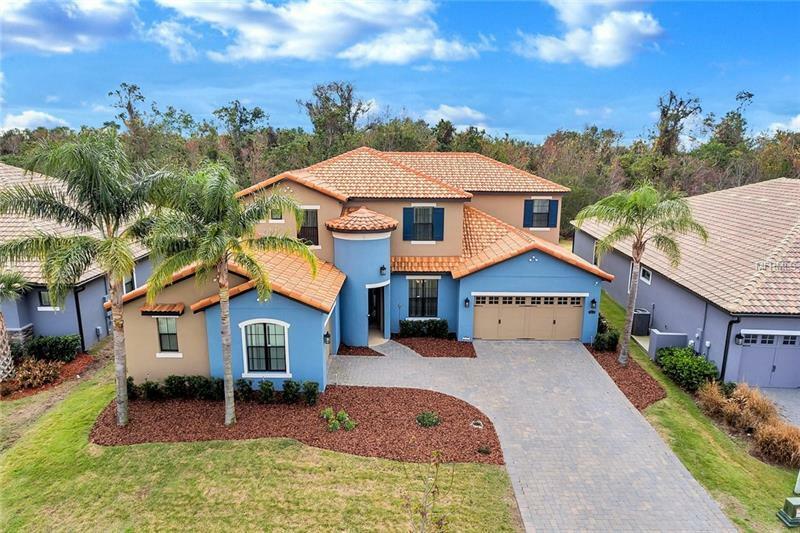 Available Now, Thousand$ Under Current Appraised Value this magnificent Tuscany inspired 6 bed / 4 bath / 4 car garage / 4357 sq ft Delfino model by Park Square homes in Bellalago community with 24 hr guard gated security. You pass the formal living room on the left and the formal dining room on the right and walk right into the grand Family room that looks right into the kitchen with its designer 42" maple cabinets, granite counter-tops, breakfast nook. Large second floor Bonus room and an open floor plan with conservation and pool views from Family room, Kitchen, Master bedroom and Bonus room. It also has an extended covered Lanai overlooking the conservation. The master spares no luxury with colossal his-and-her walk-in closets followed by a stunning master bath featuring a garden tub and glass wall walk-in shower. Bellalago is home to traditional waterfront living in Kissimmee, Florida. Located on more than a mile of shoreline along Lake Tohopekaliga. Bellalago offers 24hr manned gated security, 4 Pools, 2 Fitness Centers, heated spas, water slide, water playground, tennis, basketball courts, nature trails, picnic areas, and fishing pier. Residents can attend Bellalago's Charter Academy from K - 8th grades. Shopping, Restaurants, the Theme parks and Schools are all close by. See Realtor Remarks for further details. *HOA Fees, home square footage, and lot sizes should be independently verified. Pre- Approval/Proof of Funds required with all offers.